Send Bulk Emails instantly and Design a global beautiful HTML Email Template for your website. Search & Send Emails to your WooCommerce Customers. Use the HTML Template with plugins that send Emails such as: WooCommerce, Contact 7, Ninja, WP Forms – Send & Remarket WooCommerce Customers! 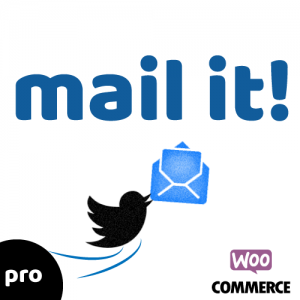 Why you will love Mailit? This will also be very handy with the WooCommerce Customers Emails, sending multiple emails instantly! This can act as ‘Content’ for your Email and This way, storing and reusing emails that you need to send, is made easy! Choose to use the template with other plugins or only for the Email Sending setting of Mail It! Search Funtionality for finding WooCommerce Customers Emails that purchased a specific product, or Products from a specific Category, or and they placed the Order drom – to dates! This way, remarketing made easy and you can build you template and target your customers! During the template building process, you will instantly see the changes made! When using the plugin only as a template and not to send Emails, the template will use Header and Footer only with the other plugins, but will override the Styling of the Content from any compatible plugin sent. You can use your credentials to send via SMTP and make sure everything will go well!. SMTP feature once the fields are set, will be also globally applied! for your Header, Content and Footer HTML Template. HTML Mail Template is built to fit any screen!